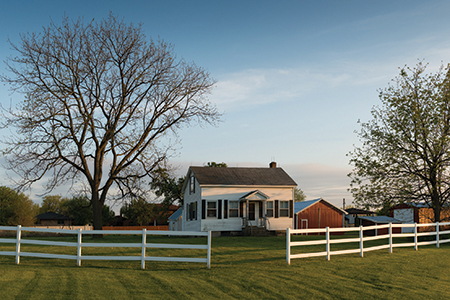 Access to affordable, safe mortgage financing is a struggle for many rural Americans. Large banks and mortgage lenders often do not operate in rural areas. The condition of many homes, while typical for rural areas, do not meet the property requirements associated with the Federal Housing Administration or Department of Veterans Affairs mortgage financing programs. Without the home loans provided through the U.S. Department of Agriculture’s (USDA) Rural Housing Service, the housing markets in many rural communities would be non-existent. The USDA Rural Development agency operates the Rural Housing Service, which provides Section 502 Direct and Guaranteed Loans to low- to moderate-income homebuyers in designated rural or “rural in character” areas throughout the country. Section 502 loans are used to build, repair, renovate or relocate a home, or to purchase and prepare sites, including providing water and sewage facilities. The Guaranteed Loans are provided by private lenders and insured by the Rural Housing Service. Guaranteed Loans are self-funded and budget neutral, meaning the fees paid by borrowers fully pay for the program, placing no burden on American taxpayers. The Direct Loans benefit very low-income or low-income borrowers with funds loaned directly by the Rural Housing Service, without the use of private lenders. Currently, USDA is in the process of reviewing agency designated “rural” geographic areas for eligibility for all Rural Development programs, including Section 502 loans. These reviews occur every five years, with the last review conducted in 2012-13. For 2018, USDA is analyzing over 700 areas currently eligible for Rural Housing loans to see if they are now ineligible for USDA Rural Development programs due to a rise in population, as determined by American Community Survey (ACS) data. This review is conducted through each state’s USDA Rural Development Office. A community with a population that has grown over the “rural” threshold could be found to be “rural in character” and thus eligible for USDA Rural Development programs. Prior to this review, USDA did not provide a consistent and openly stated standard for state offices implementing a “rural in character” analysis. NAR previously commented on the need for transparency in the review process. Last fall, USDA released new guidance on how state offices would assess whether an area is “rural in character.” Areas that could qualify as “rural in character” must have a population between 2,500 and 10,000 and successfully meet the standard “rural in character” analysis; however, USDA will consider some areas with a population between 10,000 and 35,000, if the area meets the standard “rural in character” analysis and has a serious lack of mortgage credit for lower- and moderate-income families. USDA will take into consideration several factors in the analysis to determine if a community is “rural in character.” For example, USDA will discount population numbers that stem from transient college or university students or from a prison located in the geographic area. In addition, USDA will assess the economic vitality of the area. Economic vitality factors include whether the area’s economy faces high unemployment due to loss of a major employer or whether the population is shrinking due to out migration. USDA will also look at an area’s access to a variety of lenders and mortgage financing options or if USDA plays an outsized and/or necessary role in mortgage lending. Should an area lose Rural Development program eligibility, conditional commitments for Section 502 loans issued by the Rural Housing Service prior to the implementation date of changes in eligibility will be honored. USDA expects to have the geographic area reviews finished by April 15, 2018 and any changes in eligibility implemented by June 4, 2018. To find out if an area in your state is under USDA eligibility review, please click on the direct link for your state at www.rd.usda.gov/contact-us/state-offices and look for the relevant notice. Sehar Siddiqi is the National Association of REALTORS®’ federal housing policy representative. For more information, please visit www.nar.realtor.